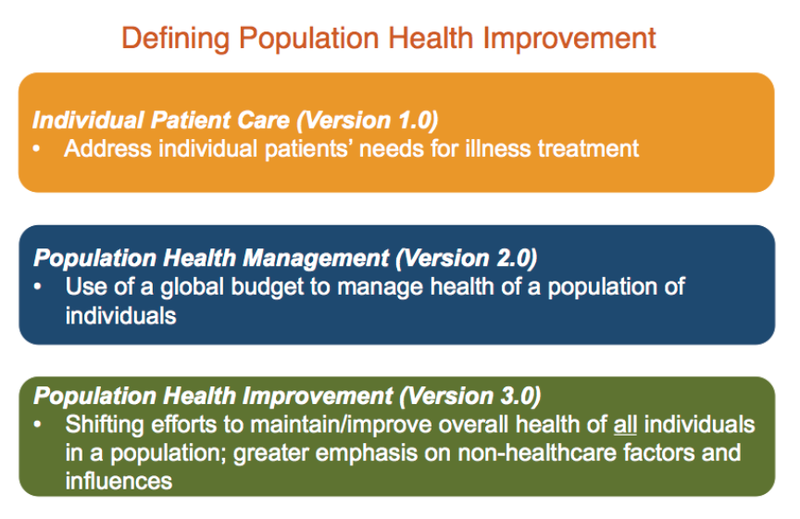 What is Population Health Improvement? Optimizing population health involves a combination of efforts to address individual, family, and community health decision needs in addition to consideration of policy constraints and resource allocation and deployment across a geographic region. Ideally, efforts are informed by both comprehensive data well as tangible discourse with stakeholders. These datamarts currently provide almost 100% coverage of Durham County, and other rural Southeastern Counties are being added. The decision support models under development should enable efforts to optimize outcomes at the individual, neighborhood and county levels. Researchers from multiple disciplines, including primary care, oncology, cardiology, mental health, and nursing should develop deep efforts with NIH, CMS, AHRQ and CDC funding to improve outcomes across the spectrum of disease. Such efforts should explicitly involve the Durham Health Innovations infrastructure that engages numerous stakeholders in setting/establishing/codifying research agenda. The infrastructure should also be used to leverage a jointly governed effort to integrate the knowledge generated through research into an action plan that improves population health.